Happy Teacher's Day! Congratulations to all the education workers on a professional holiday! We wish you inspiration, great satisfaction and pleasure from your work, grateful students and God's blessing!. On September the 15th, the "Festival of Sport” sports and entertainment festival took place at Kyiv Engineering Gymnasium. The students of Scandinavian Gymnasium were invited to participate. Thus, Ulyana Yeshchenko, our 6-grader, was solemnly awarded for the 2nd place in the in the ll "Crystal Castle” Kyiv Mayor Cup; Maria Koshechko, a student of the 11th grade, was honored for the 1st place in the "Chernivtsi Open" International Karate Tournament. 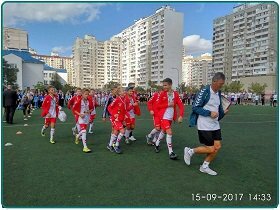 And the football team of our gymnasium (5-and 6-graders) was awarded the 2nd place in the All-Ukrainian competition for the "Leather Ball" club prize..
On September the 14th, a delegation of educators from Spain and Ukraine visited Scandinavian Gymnasium with a friendly visit. Theresa Traver, a representative of the Education Department of the town of Badahos, talked to our students, shared her impressions of Ukraine and Kyiv, and pointed out the importance of cooperation between teachers and students. 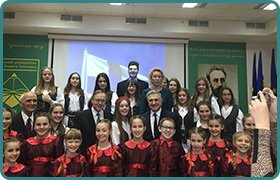 The representatives of Boris Grinchenko Kyiv University marked the high level of our students' knowledge of foreign languages, and invited them to join the celebration of the Day of Languages at the University. On September the 8th, 2017 a meeting of the first-graders of Scandinavian Gymnasium with Tatiana Mozol’, an inspector of the Juvenile Prevention Sector of Darnytsya Police Directorate of the National Police of Ukraine in Kyiv, was held. The Captain of the Police conducted classes with the first-graders: answered the students' questions, provided advice on children's behavior in times of crisis, and drew their attention to the basic road rules which all the children have to know and obey. The inspector focused on correct children's behavior on the road and in the public transport. Dear students, teachers, and parents, let us sincerely congratulate you on a wonderful holiday - the Day of Knowledge! We wish you unforgettable moments in the school life, and real discoveries! Let this academic year open up new horizons of knowledge for you, let the teachers inspire the students to accomplish their goals, and the parents be proud of their children. We wish you good, inspiring and successful year! . 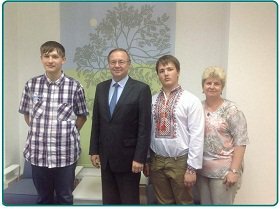 On June the 26th, 2017 the solemn ceremony of handing school-leaving certificates of full secondary education to the eleventh-graders was held at the Ukrainian House. Among them, 11 students received Gold and Silver medals for outstanding achievements in their studies. The words of gratitude from the students addressed to their teachers were heard from the stage. And the teachers, in their turn, wished their dear pupils good luck and happy life journey. Yelyzaveta Fedorovska, a student of our gymnasium, has finally returned home after a year at Rosville School (USA). Liza not only studied there, but went in for sports, and worked as a volunteer. 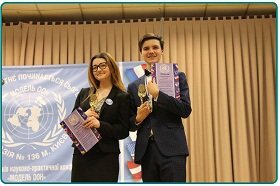 She also won the title of the Best Delegate during the American UN Model which was held at the UN headquarters in New York. We are proud of you, Liza, and we are confident that this year has become useful and important for your future achievements! 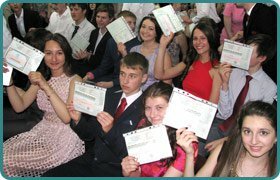 On June the 15th, the ceremony of awarding 9th-graders the certificates of basic secondary education took place at Scandinavian Gymnasium. The students ascended the first step of their life's journey: some of them will leave the gymnasium to study at colleges and vocational schools, while others will continue their studies at our institution. We are grateful to all the teachers who helped the students get knowledge and shared their warmth with them. We appreciate the assistance of the parents who always supported their children and the school. The students of our school are often asked what makes our gymnasium Scandinavian, and what benefits we have from that other than learning the languages of Scandinavian countries? We can answer this question. A huge bonus for our students is the opportunity to communicate and cooperate with representative offices of Finland, Sweden, Norway and of Denmark in Ukraine and to visit partner schools in the aforementioned countries. The Children's Day was celebrated by the students of Scandinavian Gymnasium at the language summer camp. The children took a rest outdoors and communicated in English and German.The students showed their creativity in the course of a drawing competition. Let’s take care of our future - our children! Teachers of Scandinavian Gymnasium know how to make summer merry and informative for the students. To accomplish this goal a language summer camp works at the gymnasium: 2 weeks of entertainment and foreign languages. The main objective is to get the students interested in learning foreign languages, to help them overcome psychological and language barriers. On May the 26th, the ceremony of the “last bell ringing” was held at Scandinavian Gymnasium. This day is always joyful and sad at the same time. Joyful because it ends the school year, and wonderful summer holidays are ahead, and sad, because this is the last time the school bell rings for the graduate students. Farewell to elementary school! On the eve of the end of the school year, traditional elementary school graduation parties took place at our gymnasium. This year, six 4th forms presented their teachers and parents with wonderful emotions during their performances. On May the 24th, 2017 our Merry Notes Choir presented their reporting concert. 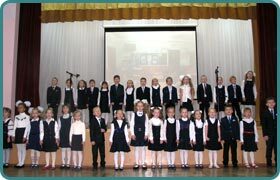 The choir sang in public during the whole school year, participated in most of the activities at the gymnasium, and won a lot of victories in various competitions. This time, the senior and junior groups of the choir performed more than 10 various pieces of music. 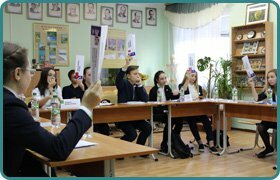 On May the 22nd, 2017 the elections to Kyiv Darnytsya District Children’s Parliament took place at Scandinavian Gymnasium. 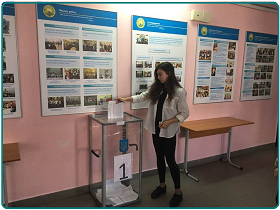 13 students announced their candidacies for the elections. 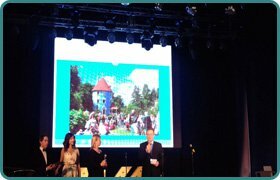 On May the 20th, 2017 an event dedicated to the culture of the Nordic countries took place in Kyiv History Museum with the support of the embassies of Denmark, Norway and Sweden. The grand opening event was held with the participation of our students dressed in costumes of northern countries. They told the guests about our gymnasium, sang songs and danced to beautiful music. How to make learning English merry and useful The students of Scandinavian Gymnasium know the answer. 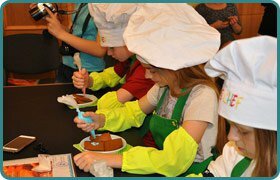 Natalia Lyashko, the founder of the «Kids Chef» children's culinary academy, visited our school and provided a Cookery Class. During an interesting and tasty master class the students studied English and prepared culinary masterpieces simultaneously. They were happy to participate in such a helpful and delicious workshop! Outside, the spring is in full blossom. Scandinavian Gymnasium is also full of flowers on the 18th of May. It becomes an artistic center of embroidery. The holiday started with the radio newspaper "Embroidery - the genetic code of our nation." 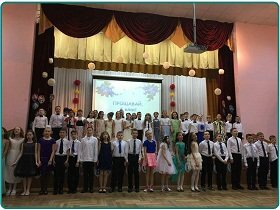 During the day, the gymnasium hosted an art exhibition "Embroidery - a mirror of people's souls" and "Eternal Song of Colors", an exhibition of students’ family photographs. Dear parents, we would like to invite your children to visit Slovakia in the framework of the project "English in the Sun." The trip is scheduled from 20.06.2017 to 05.07.2017. The children will be staying at the "Branko" tourist center – the center for children and youth located in the forest reserve with two artificial lakes, sports and children's playground, a place for fire, a hall for discos, and a football field. Five meals a day are provided (European – Slavic cuisine). Packed lunches are available for children on all the trips. 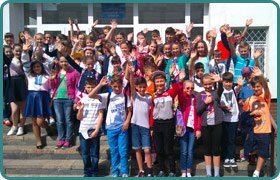 On May the 29th, 2017 the "Step by Step" summer language school begins its work for the 1st – 4th graders. Within 3 weeks spoken English and German, familiarity with the culture and language of the Scandinavian countries, interesting experiments, cognitive quests, tours, entertainment and new friends await the children. With us, your child’s spare time will become a fascinating and colorful game. Our congratulations to Alina Kal'chenko, a student of the 5V form, who became the champion of Ukraine in shinkyokushinkai karate kumite section. The championship was held on May the 13th, 2017 in Odessa. We are proud of you, Alina, and we wish you new victories! On the 11th – 14th of May, National Korolenko Pedagogical University hosted the second International Scientific Conference "The North Wind. The Nordic world in education, science and culture of Ukraine." The conference was attended by teachers and students of Scandinavian Gymnasium, representatives of the universities of Denmark and Sweden, scientists from all over Ukraine. Educated, intelligent and wise people always arouse great respect and admiration. Their great deeds are retained for centuries. Therefore, the students of the 10th grade chose the topic "The Greatest Britons" for their regional geographic quiz. The students told interesting facts about the life of those people of the Foggy Albion who impressed them the most. On the 12thof May a real family holiday took place at Scandinavian Gymnasium! The students of the 2B class congratulated all mothers and grandmothers on Mother's Day. It became a meeting place for whole families combining them into one big family called " form 2B". True gentlemen congratulated mothers and grandmothers leaving no girls, mothers and grandmothers unattended, giving them songs, dances, and of course flowers! Every year the "Greenwich" competition of experts in the English language takes place in Ukraine. This year, 212 students of Scandinavian Gymnasium participated in the competition. 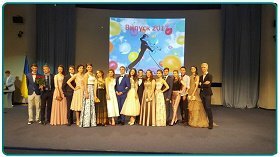 Consequently, 19 students of our school won the prizes in Ukraine. 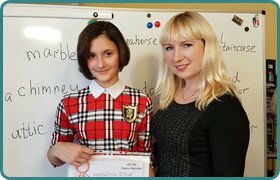 Sofia Ohahifo, a student of the 2V form, Maria Oleksiyenko, a student of the 2A form, Stephania Smotrova, a student of the 3A form, got the Gold certificates and won the first places. 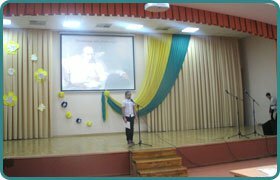 On May the 10th, 2017 the "Two Hearts - One Soul" online-conference dedicated to the life and work of the greatest poets of Georgia and Ukraine Lesya Ukrainka and David Guramishvili was held between Scandinavian Gymnasium and Tbilisi Public School#98. 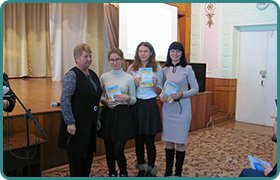 Ukrainian and Georgian students carried out extensive research into the biographies of both poets and visited the museum of David Guramishvili in the town of Myrhorod, Poltava region, and the Museum of Lesya Ukrainka in the town of Surami, Georgia. 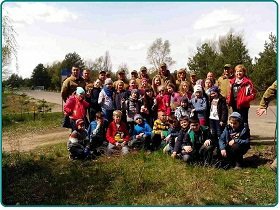 From the 20th to the 28th of April the traditional Week of Environmental Education was held at Scandinavian Gymnasium. A variety of interesting activities took place in the framework of the event, in particular, the meeting with Olga Cherniavsky, the Head of Ukrainian public organization, who talked about sorting waste. On the 27th of April, a delegation of school teachers from Norway came to Scandinavian Gymnasium. The representatives Pedagogical University shared their ideas of democratization and educational environment with our students and teachers. The problem of clean environment does not leave any man indifferent. The students of Scandinavian Gymnasium also actively participate in solving environmental problems. They take part in oral journals, presentations, discussions, exhibitions of hand-made articles. 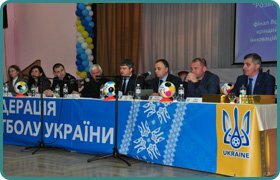 From the 13th to the 17th of March the nationwide soccer tournament for the prize of the "Leather Ball" Club was held at Darnytsya Engineering Gymnasium. The competition involved 28 schools and the team of Scandinavian Gymnasium won the first place. Our primary school students are very active participants of the festival of foreign languages. Capable and talented, our young students show a high level of preparation and much interest in the English language learning. One of the most interesting events of the festival was the competition "My favorite letter". 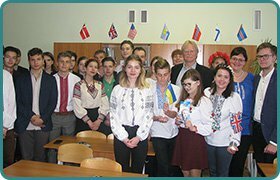 On April the 24th, 2017 the students learning the Swedish language together with their teacher Marina Vyrlyeyeva participated in the Days of the Swedish Culture in Ukraine at the Institute of Philology of Taras Shevchenko Kyiv National University. Among the invited guests were representatives of the Embassy of Sweden in Ukraine, the Swedish Institute, and also foreign firms and companies. On April the 21st Queen Elizabeth II celebrated her 91st birthday. In their English lessons, the students of the 7th grade together with their teachers wished many happy returns of the day to the Queen and held multimedia lessons «Happy Birthday Queen Elizabeth II!». 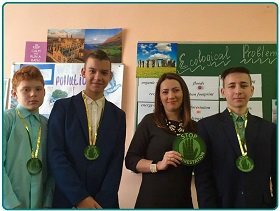 The students of the 4B form together with their teacher Nadia Sabadash organized a lesson “Earth is Our Home” devoted to caring attitude to our planet. The students actively participated in the discussion of the problems of protecting the environment. 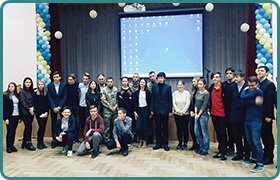 On April the 19th, 2017 the workshop "PTE General - to succeed together" was held for the students of the 10th grade. Our guest, Gennady Bilous, a methodologist of Dinternal-Book, an international educational center, stressed the importance of the English language in today's successful life. 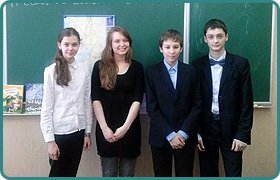 Lesson-Debate "Ecological Problems in Great Britain"
On April the 18th, 2017 a lesson-debate on ecological problems in Great Britain was held for the students of the 8th grade. During the event the students established organizations which debated major environmental problems posing a threat to the environment in the UK. On the eve of Easter, the students studying German held the Holiday Kaleidoscope dedicated to the Easter traditions in Germany. The students of the 6B form sang songs, solved puzzles, and staged "Little Red Riding Hood and Her Friends." In anticipation of a big holiday, non-standard lessons-quests were held in Scandinavian Gymnasium. The Easter Bunny came to the students of the 3rd grade with a variety of thematic tasks. 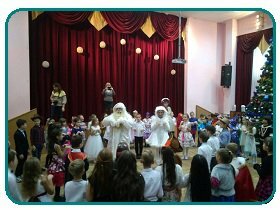 The children learned words and expressions, plunged into the Easter traditions with great enthusiasm and participated in very interesting quests. On the eve of Easter, the students of the 3A form became active participants in the cognitive quest for Easter Bunny. The children studied traditions of celebrating Easter in England. They were in high spirits and under the guidance of their English teacher found all the gifts. 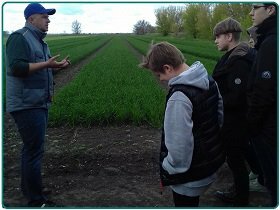 On April the 14th, 2017 Sergiy Vlasenko, a methodologist from Darnytsya Center for Children and Youth met with the students. He spoke about a new project for Kyiv - Darnytsya Student Parliament that will begin its work on September the 1st, 2017. Reciting poems, especially in foreign languages, is the ability to beautifully express the views of the author, using artistic means, the ability to get the listener interested and to convey the meaning and the feelings that the author put into poetry. 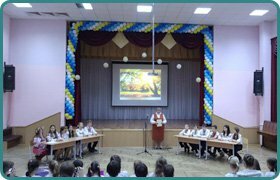 In early April, our gymnasium held a competition for readers of poetry in foreign languages among the students of the 7th grade. Foreign Language Festival "English Traditions in Scandinavian Gymnasium"
The foreign language festival "English Traditions in Scandinavian Gymnasium" is underway. 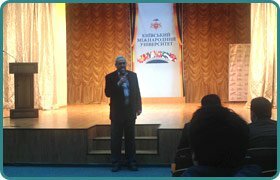 On April the 12th, 2017 a thematic event "Let's learn more about Britain" was held in the 9V form. 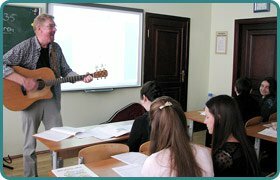 The students prepared video-presentations, took a quiz and sang English songs to a guitar. The winners were awarded sweet prizes. The International Children's Book Day is devoted to the birthday of the famous Danish storyteller Hans Christian Andersen. The students who study the Danish language are always happy to participate in various activities and quizzes. Thus, the students of the 5A and 6A forms organized a quiz devoted to the biography and works of Hans Christian Andersen. 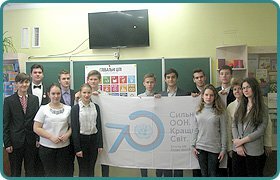 International UN Model «ELUMUN 2017"
On April the 7th- 9th, 2017 Lviv warmly greeted students and pupils from different cities of Ukraine, Latvia and Estonia who came to take part in a unique educational event, the International UN Model «ELUMUN 2017". Scandinavian Gymnasium was one of the capital's two schools that visited that UN Model. 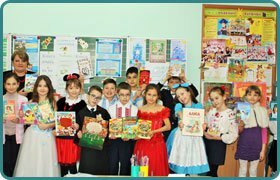 On April the 6th, a "Presentation of the Favorite Book" lesson was held for the students of the 8B and 8D forms. The students learned about the history, origination and development of the Book, about the oldest, largest, heaviest, smallest, most popular publications. The most interesting part of the lesson was the presentation of students’ favorite works. The Week of the Book in Scandinavian Gymnasium was full of extremely diverse activities. 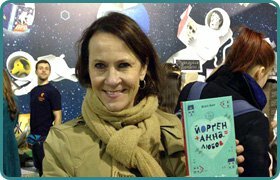 In the elementary school library lessons and a literary quiz devoted to the tales of Hans Christian Andersen were held. 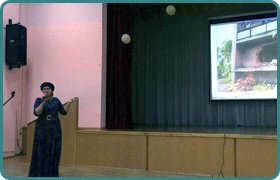 Yaroslava Muzichenko, a journalist and an ethnologist of the National "Memorial to Holodomor Victims" Museum, visited Scandinavian Gymnasium and provided a master class on decorative art. The students of our gymnasium enjoy learning English and are always involved in district and city competitions achieving high results. Thus, the Canadian CanSchool project thanked the Headmistress of Scandinavian Gymnasium and all our staff for raising talented and hardworking students. In particular, for excellent preparation of the 9-10-form students for the Сontest in English. 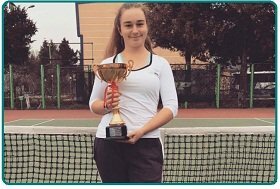 Congratulations to Daria Snihur (9A) on winning the 37 International tennis tournament "Tashkent ITF" (Uzbekistan) who won the first place among 64 participants. Also, our Dasha became the first in the International «Dustlik» Tournament in the city of Namanhan (Uzbekistan). 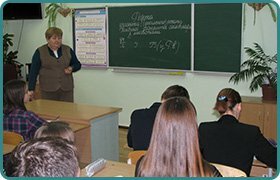 Recently, different articles on a large number of UN Models in various educational institutions and our participation in them have appeared on our web-site. But when did it all start? Who was a pioneer in promoting the Model in our country? The first UN Model in Ukraine took place in Kyiv Business Lyceum twenty years ago. They say, spring is the season of UN Models. And it's true because every weekend there is conference. And what model can do without our active modelers? On March 17th-18th, our students participated in the UN Model at Gymnasium#136. On March the 17th the holiday that has its roots in the ancient Ireland came to Scandinavian Gymnasium. 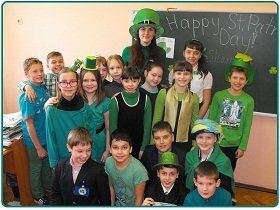 On this sunny spring day and under the guidance of our English teachers the students learned about the holiday, and organized a small flash mob, wearing the traditional holiday color - green. 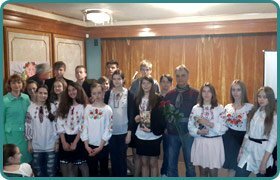 On March the 15th, 2017 a reciter contest "Shevchenko in Different Languages of the World" took place in Kyiv. 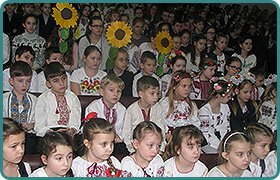 36 participants from Darnytsya schools recited verses of the great poet. The masterpieces by Taras Shevchenko were recited in German, Polish, Belarusian, Chinese, Russian, English and Azeri languages. Daria Kapinus (7E) represented Scandinavian Gymnasium and recited the poem"The Cherry Orchard by the House" in German. 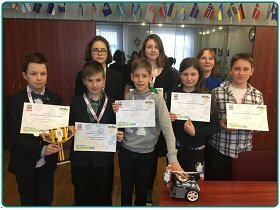 On March the 11-12, 2017 the first Ukrainian festival «ROBOfirst - More Than Robots" took place. The festival «ROBOfirst - More Than Robots" is a large-scale international event in the field of education, science and technology where talented, creative, erudite children aged 6 to 16 from all over Ukraine demonstrated their skills in the area of designing, robotics, programming, engineering and architecture. This is a happy sign of fate that early spring and the birthday of the great Kobza-Player come at the time when the earth awakens from frost and gathers strength for development. 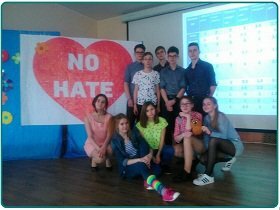 On March the 3rd- 4th our team of 9-10-grade students took part in the quest "Safe Online 2017" in Kropyvnytskyi. They worked efficiently throughout the day. The event consisted of a large number of interesting tasks that required creativity of the members, and one part of the event was a dance marathon where our team had the opportunity to dance rock 'n' roll. This weekend our students visited the charming town of Lion and participated in the III All-Ukrainian UN Model. This year the team was considerable - 12 people, students of the 7-9 grades. They represented different countries: the USA, the Arab Republic of Egypt, the Republic of Korea, the Federal Republic of Nigeria, the Republic of Italy, the Federal Democratic Republic of Ethiopia and other countries. On March the 3rd, 2017 the VIII All-Ukrainian "Sunflower" game was held in Scandinavian Gymnasium. Traditionally, it was attended by the students of the 2nd – 11th grades. On this day, the atmosphere of genuine holiday of reason and beauty reigned. Workshop for Teachers of English "The 21st Century Learning Skills"
On March the 3rd a seminar for teachers of English from Kyiv and Kyiv region "The 21st Century Learning Skills" was held at Scandinavian Gymnasium. It was organized by the Express Publishing House and its FOLIO BOOKS representative company. Charity Event "Happy Meow for Murchyk"
From the 13th of February to the 1st of March, the "Happy Paw" Foundation in the framework of the "Bioethics" project conducted the nationwide charity campaign «Happy Meow for Murchyk" traditionally dedicated to the World Day of Cats. This year, our elementary school students joined the campaign. 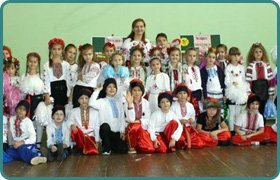 Humanitarian Week of the "Constellation Elementary School - 2017" festival was held under the slogan "I love Ukraine". 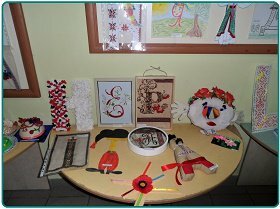 It started with a competition "Dress a Letter into Embroidery” among the students of 1-2 grades. The students made different drawings, three-dimensional applications and soft toys in the form of letters. 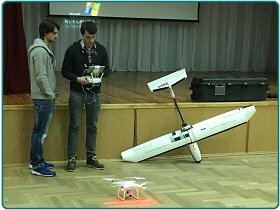 On February the 21st, in the framework of the "STEM - professions of the future" project, a meeting with the representatives of the Drone.UA company was held in Scandinavian Gymnasium. The company specializes in creating drones, and promotes their use in various fields of Ukrainian and world economy. Valery Yakovenko, a co-founder of the company, conducted a master class for the students who showed interest and asked a lot of different questions. On February the 17th, the students of the 8B form visited the "Heroes do not die, they live forever" exhibition at the National Museum of History of Ukraine. The exhibition hall of the museum was full of people, among them the soldiers who became heroes of Ukraine in 2014-2016, cadets, and relatives of the fallen soldiers. 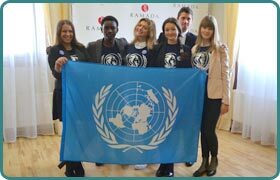 On February 17th-18th, 2017 UN Model "LNZMUN'2017" took place at Naukova Zmina Lyceum. This is the second conference at this school where two teams from Scandinavian Gymnasium have participated. This time out teams represented the United States (Anastasia Perevereten, Alexandra Rekunova, Alexandra Osnach, Andriy Krut’, Leonid Khomenko, Daria Zhiltsova) and the Russian Federation (Kateryna Pravik, Ivan Kirillov, Mykyta Ivanchuk, Maria Kirichenko, Nikita Dyminich, Ian Savrasov). In the Scandinavian Gymnasium, much attention is paid to the development of legal culture of the students. Thus, our sixth-graders attend the "University for Young Lawyers." 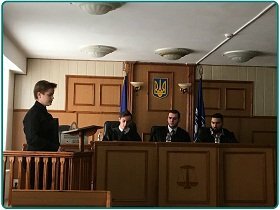 This is a new social project of the Shevchenko Kyiv National University Faculty of Law. The project is aimed at 6th-8th- formers wishing to acquire new knowledge in the field of law. On February the 17th, the "Welcome to Our Neighborhood" quiz was held at the specialized school #296. The students of Scandinavian Gymnasium took part in the game covering the topic "February Holidays in Great Britain." Four teams competed in the quiz. 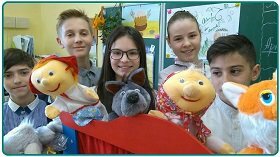 Scandinavian Gymnasium was represented by the students of the 7E form (K. Nagorna, D. Kapinus, L. Adamovska, K. Halushko, N. Prozhivalsky) and S. Myts, an English language teacher. On February the 17th, a meeting with representatives of the Nadiya Women's Center took place in Scandinavian Gymnasium. The Center takes care of the former little prisoners of Nazism. The children of two wars, Nadezhda Slesareva, the Chairman, and Victor Sosov, a native resident of Kyiv, told our students about children's fate in Nazi concentration camps. 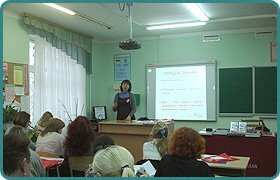 On February the 17th, 2017 Scandinavian Gymnasium held the «Classroom Management» workshop for the teachers of English. 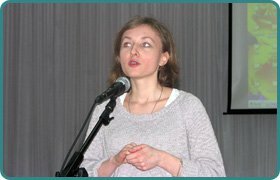 Natalia Lyashko, a methodologist of "FOLIO BOOKS" conducted the workshop. The teachers had the opportunity to receive necessary and useful information on the organization of the work in the classroom. On February the 15th, our students met with the students from Farringtons Junior School, Kent, Chislehurst, England. Alina Sandul and Yulia Shcherbak (11A form) warmly welcomed the English guests on the threshold of Scandinavian Gymnasium and showed them around the gymnasium. The guests attended an English lesson in 8B class during which the children had a good opportunity to communicate with the native speakers. In February, interesting guests visited Scandinavian Gymnasium: the owner of the German festival "Filmboardkarlsruhe", the director and theater critic Marcus Niden together with representatives of the Atyudyky Family Center and “6 - 16 FES” art platform Tatyana Nesterova, Zoryana Kutz and Tatiana Golubchuk. 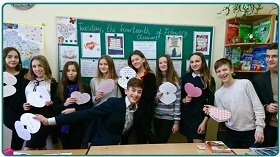 On February the 14th, the students of the 8th grade attended the lessons devoted to the Day of Lovers. The children plunged into the history of the holiday and got acquainted with the traditions of its celebration around the world. Scandinavian Gymnasium is 12 years old! All the class collectives participated in the traditional celebration. 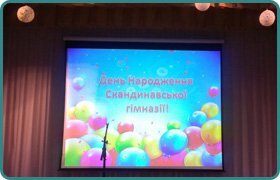 The primary school pupils celebrated the holiday watching cartoons in the cinema. The secondary school students staged various interesting performances in the assembly hall, namely presentations, surprises, fireworks of future professions, trips to Georgia, Greece, Italy, Israel, Great Britain. On February the 2nd, a regular meeting with Marina Sheremet, a volunteer, who reported on the work of Marina Sheremet Foundation and told about her trip to the ATO zone. Scandinavian Gymnasium is a partner of the foundation and is involved in many initiatives including collection of waste paper, plastic, etc. to purchase foodstuffs and other necessary things for the ATO fighters. 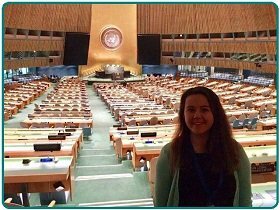 On February the 1st- 4th, 2017 Yelyzaveta Fedorovska, a student of Scandinavian Gymnasium, doing a training course in the US in the framework of the Future Leaders Exchange Program (FLEX), was able to attend WFUNA International Model United Nations which took place at the headquarters of the United Nations in New York. 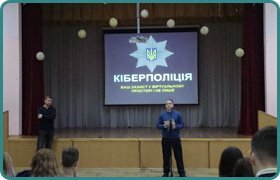 On February the 1st, the officers of the Cyberpolice, a structural unit of the National Police of Ukraine, Alexander Dihtyaruk and Maxim Polyakov told the students of the 8-11 grades about the fundamental aspects of Cyberpolice activities, safety in social networks and the Internet. Lesson in Nature: Help the Birds! On January the 17th, 2017 a nature study lesson was held for the students of the 2B form in the school yard. Girls and boys hung birdfeeders made together with their parents. 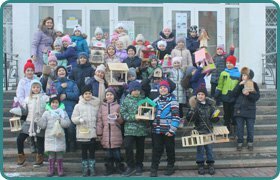 The children know that in winter the life of the birds depends on whether they find food, so the kids not only hung the feeders, but also filled them with food. 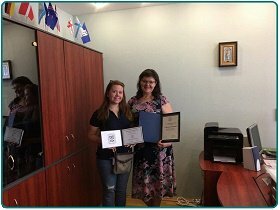 On December the 17th I. Marko, our teacher of English, and Anastasia Prozhivalsky, a student of the 7th form, were invited to the Express Publishing methodological center where the «Story Time» competition award ceremony took place. 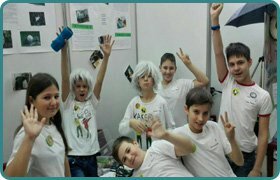 On Saturday, December the 10th, a qualifying tournament in robotics and science - First LEGO League – was held in Kyiv, in the Palace of Children and Youth. The tournament brought together 25 schools from all over Kyiv. 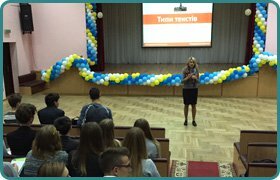 On the initiative of GoGlobal in cooperation with the Ministry of Education and Science of Ukraine, and the British Council in Ukraine, Scandinavian Gymnasium took part in the nationwide project "English Week" which is devoted to the official completion of the Year of the English Language in Ukraine. Еarly in December, an annual scientific conference of the Minor Academy of Sciences was held at Scandinavian Gymnasium. The event was attended by students, members of the “Erudite” scientific society, and their teachers. Inna M. Fursova, Deputy Director of Scandinavian Gymnasium, presented the achievements of our students at All-Ukrainian MAS competition in the 2015-2016 academic year. For three months Tim Sappala, a volunteer teacher of Finnish and English, was working at our gymnasium. A wonderful teacher, a wonderful person, Tim managed to make all the students studying Finnish to fall in love with him. 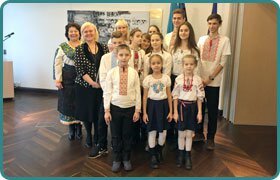 On occasion of the 99th anniversary of Independence of the Republic of Finland, the students of Scandinavian Gymnasium participated in the solemn event which Yuha Virtanen, the Ambassador Extraordinary and Plenipotentiary of Finland to Ukraine, attended. 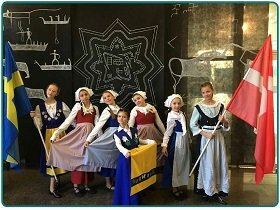 On the 7th of December, our 9th-graders participated in a very interesting event - "Days of Poland in Kyiv International University. On December the 7th, on the day of the local government, in the session hall of Kyiv City Council the first session of the Young People's Parliament of the capital was held. On December the 6th, the Day of the Armed Forces of Ukraine is celebrated. The cadets from the Military Institute of Telecommunications and Information came to Scandinavian Gymnasium. «America House Kyiv» under the auspices of the “Cities of Ukraine” Association. 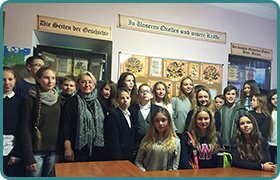 On November the 29th, the students of the 7D form together with I. Marko, their form mistress, a teacher of German, visited the center of German culture. 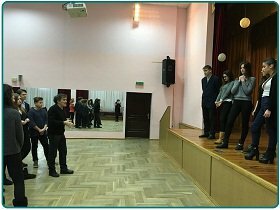 Liudmila Schneider, the Director of Kovalenko Center, told the students about the organization and its areas of work, as well as about the projects in which the students can participate. 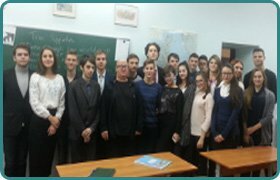 On December the 2nd, Anastasia Prozhivalsky, Bogdan Chepurny, Catherine Nagorna, Darya Kapinus, Ekaterina Halushko, the students of the 7E form with their teacher I. Marko took part in the intellectual tournament "About Europe" held in Slavic Gymnasium. During a week, a delegation from Tbilisi partner school #98 (Georgia) was on a visit at Scandinavian Gymnasium, and joined the students’ conference " UN Model: Scandi -2016". Scandinavian Gymnasium. The representatives of Vinnytsia, Dnipropetrovsk, Kyiv, Mykolayiv and Kharkiv regions became the finalists of the contest. On November the 25th, the “UN Model: Skandi – 2016” VIII regional conference "Transforming our world: achieving the global sustainable development goals by 2030" was held at Scandinavian Gymnasium. On October the 26th, the students of Scandinavian Gymnasium participated in the regional "Junior Tournament" game. 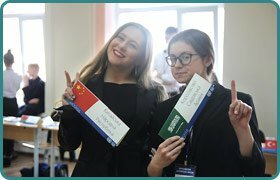 Carrying out the tasks of the competition, the team of Scandinavian Gymnasium consisting of the students of the 6th grades, not only demonstrated a sufficient level of knowledge of the foreign language, but also showed the knowledge of the English and the world culture. the author's poetry by Darya Lisnychenko, the student of the 7B form. On the 27th of October, a ceremonial event – Initiation of the youngest students into the first-graders – was held at Scandinavian Gymnasium. 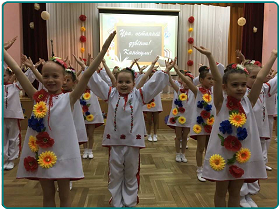 Our young students recited poems, sang songs, and danced Ukrainian dances. On October the 21st, a meeting with the servicemen of the 10th Mobile Frontier Detachment HF 1496, major Sergei Artyukh, lieutenant Oleg Panchyn, and sergeant Mikhail Bolshakov took place. 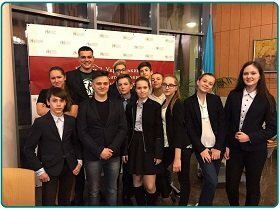 On October the 20th, the students of Scandinavian Gymnasium presented their research papers at the VII All-Ukrainian student linguistic and literary conference "Cherkasy and International Humanitarian Space" which took place in the specialized school #28 named after Taras Shevchenko (Cherkasy). Two wonderful days spent together with the high school students in the city of Lviv did end. “Along the Paths of Ivan Franko”. That was the name of the excursion that brought us closer to the genius of the Ukrainian people. 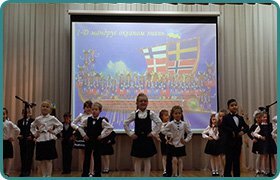 On October the 12th and the 13th, the students of Scandinavian Gymnasium celebrated the Day of the Defender of Ukraine and the Day of the Ukrainian Cossacks. The boys of the 4A form showed excellent physical fitness, and the girls supported their classmates with dances. After the competition, the students received gifts. In October, the workshop to prepare 11-grade students for External Independent Evaluation in English: «Towards EIE 2017: Exam Readiness» took place at Scandinavian Gymnasium. Elena Mihoduy, a methodologist from Dinternal Pearson International educational and methodological center provided a series of training sessions to prepare high school students for EIE in English. On October the 14th, the second scientific conference for students of the 7th- 8th grades, "UN Model: Skandy - Junior 2016", took place at Scandinavian Gymnasium. The students of our gymnasium as well as the guests from Naukova Zmina (Scientific Change) Lyceum participated in the event. All the teams showed an adequate level of training and diplomatic skills. 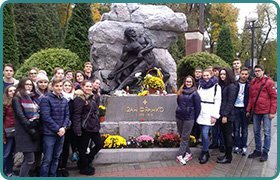 On September the 28th, our students took part in the Marina Sheremet Foundation charity event aimed at meeting the needs of the ATO fighters. 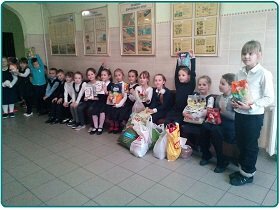 The students gathered boxes of food and necessary items for «Svityaz" and "Bogdan" units, brigades #92 and #44 of the voluntary battalions. Every day, Marina Sheremet Foundation receives many requests for help. 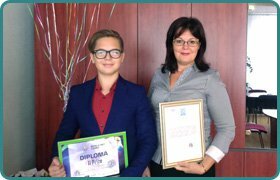 In July, 2016 Denis Shulga, the student of the 9th grade took part in the International remote «World Art Games» competition (Fiestalonia Milenio, Spain). 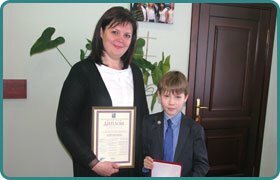 Having submitted his video, Denis received a Diploma of the II degree. Every year in September, the Day of Physical Culture and Sports – the holiday of might, beauty, health, harmony, and cheerful mood – is celebrated. Our congratulations to all those who love sports, who are ardent fans, who go in for sports, and all those who cannot imagine their lives without sports. Scandinavian Gymnasium is proud of our students – sports winners. Happy September the 1st – the Day of Knowledge! Our congratulations on the Day of Knowledge - a popular holiday of enlightenment, wisdom, youth and hope, which always remains in the memory of every person. Again, Scandinavian Gymnasium opened the doors to the students starting the new school year. How can we make summer merry, mirthful and informative for our students? The teachers of Scandinavian Gymnasium working at the summer language camp have found the answer to this question. On the 9th of June, the festive graduation ceremony where our 9th-graders received certificates of basic secondary education took place at Scandinavian Gymnasium. During their school studies our students obtained life orientation and values, discovered and developed talents for various activities. On June the 4th «I love cooking» project winners were invited to the Express Publishing House methodical center. The event was held in friendly and creative atmosphere. Scandinavian Gymnasium was recognized as the most active school. All the finalists received certificates and prizes. Interesting interactive games were played during the meeting. On June the 1st the event devoted to the International Children's Day took place at Scandinavian Gymnasium. 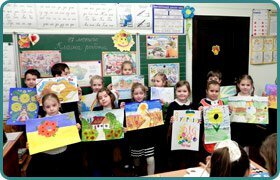 The "Painting for Peace" contest was held by the International Organization for the preservation and development of the people. On May the 28th the graduation ceremony was held in the gymnasium. Eighty-six 11th-graders received school-leaving certificates of complete secondary education. Eight people were awarded gold and silver medals. 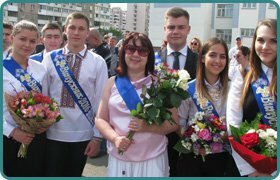 On May the 27th the festive 'Last Bell' ceremonies devoted to the end of the academic year were held in Ukraine. 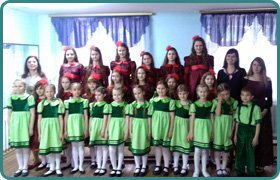 On May the 25th a summary concert of the "Merry Notes" choir took place. 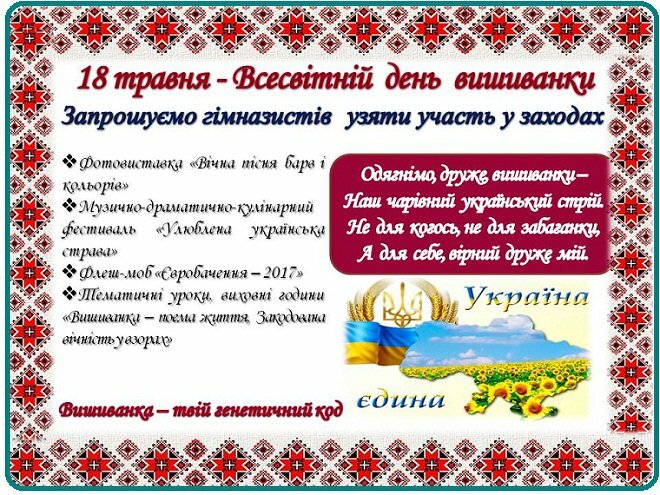 It has already become a good tradition to sum up the year’s achievements singing songs by Ukrainian and foreign authors. What is STEM? STEM is an acronym used to refer to science (Science), technology (Technology), Engineering Design (Engineering), and Mathematics (Mathematics). "STEM: professions of the future" is a unique project being implemented in the world for many years. It was launched in Ukraine last year. 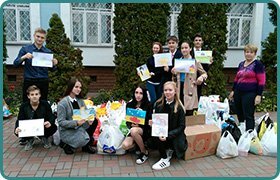 20 schools in Kyiv participated in the project. 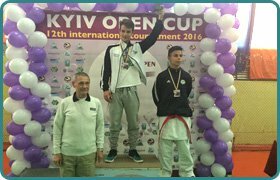 On May the 21st Kyiv Polytechnic Institute sports complex hosted Kyiv Open 2016 international karate tournament. 700 sportsmen from four countries and 45 clubs took part in the competition. Our “Shogun” club won the 2nd place with 10 gold, 4 silver and 5 bronze medals. On May the 20th the "Help the ATO soldier" charity event supported by Marina Sheremet Foundation was completed. The students collected 2528 kg of waste paper and 158 kg of plastic caps. Having converted to cash secondary raw materials, the organizers of the charity event will purchase necessary devices for Ukrainian reconnaissance scouts. 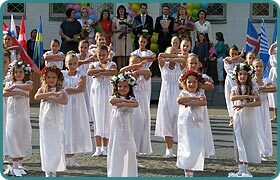 On May the 19th the Ukrainian community worldwide celebrates the Day of Embroidered Shirt. The holiday was founded by the students of Yuriy Fedkovich Chernivtsi National University in 2006. On May the 19th a meeting of our senior students with Oyvind Nordshletterom, the first Ambassador of Norway in Ukraine, a representative of Fridtjof Nansen Center for Peace and Dialogue, and members of the Ukraine-Scandinavia Center took place at Scandinavian Gymnasium. Not long ago, our 4th-graders said goodbye to elementary school. Years of study passed as one perfect moment. Scandinavian Gymnasium has become their home during this time. Our fourth-graders have matured, gained deep knowledge, and have shown that they are ready to become high-school students. 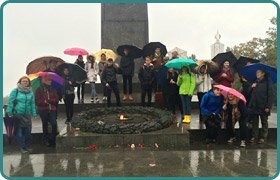 The students of Scandinavian Gymnasium joined the Day of Commemoration of the Victims of the Genocide of the Crimean Tatar people. 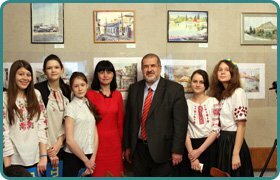 On May the 18th our students took part in the opening of the exhibition of young Crimean Tatar artists, and on May the 30th they participated in the literary and art event "Deportation of the Crimean Tatars in the light of art of the Crimean Tatar literature" in the National Museum of Ukrainian Literature. The teachers of foreign languages are constantly working in order to improve their professional level. To achieve this goal, a regional workshop on "Guidelines for organizing and conducting activities in the 2016 language camps" was held on the 18th of May. Natalya Lyashko, Express Publishing House methodologist, delivered a report for the teachers of the Darnitsa district. 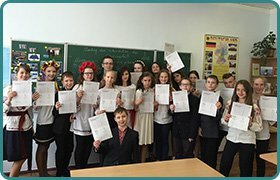 On May the 16th the six-graders of Scandinavian Gymnasium passed the exam in German “Fit in Deutsch 1”. The students had the opportunity to study the format of an international standard exam, and to test their knowledge of the German language according to the European standards. The exam was taken by 23 pupils. 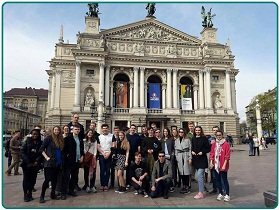 From the 2nd to the 8th of May, 2015 the students of the 10V form of Scandinavian Gymnasium traveled around Western Ukraine in the framework of the program “Castles and Palaces of Lviv and Fabulous Transcarpathians”. They visited Koretsky, Dubno, Uzhgorod, Mukachevo, Staroselsky, Podgoryansky, Olesko, Chinadievsky castles, and the castle of Schonborn. Scandinavian Gymnasium is proud of its talented students. This year, Roman Fedyurko (5A) and Daria Snihur (8A) came home with glorious victories. 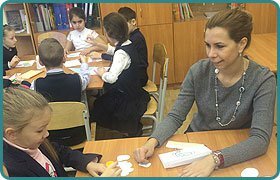 At the end of April - early in May traditional demonstration lessons in English for parents of the first-graders took place at the elementary school. The students of Scandinavian Gymnasium have celebrated the Day of Reconciliation and the 71st anniversary of the victory over Nazism in World War II. The Lessons of Memory took place in each class. 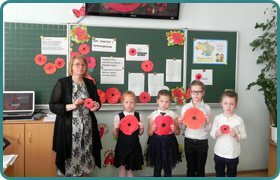 The children learned about the terrible and very expensive price the world paid for peace and about the contribution of the Ukrainian people into the victory over the brown plague. competition-defense of the Minor Academy of Sciences research works took place in the assembly hall of Scandinavian Gymnasium. On April the 25th – 28th Scandinavian Gymnasium met the guests from the Finnish town of Reisjarvi. The students and teachers from the Finnish schools were enchanted with our city, our gymnasium and the hospitality of the Ukrainian families. The Finnish delegation took part in educational and extracurricular activities, attended classes, travelled around Kyiv, visited historical sites. "Literature makes it possible to liberate the imagination and to write about things that you probably haven’t seen, but you feel that way. This is another, higher level of writing,” says Alexander Gavroche, journalist and writer from Transcarpathia, who met with our students at the National Museum of Literature of Ukraine on April the 28th, 2016. The meeting was like a warm sincere conversation of friends and family. Farewell to Primer, My Best Friend! At last, our first graders turned the last page of the Primer! Nearly the whole academic year together with their teachers they diligently learned to read and to write, letter after letter. The ABC opened for them the road into exciting new world of knowledge. Late in April the "Farewell to Primer" holiday for the first-graders took place in the assembly hall of Scandinavian Gymnasium. 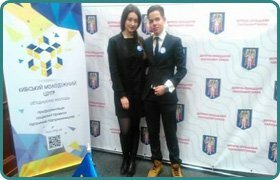 On April the 22nd – 24th the students of Scandinavian Gymnasium participated in UN Model Lviv. It was an incredible experience for each participant, regardless of the number of previous games. 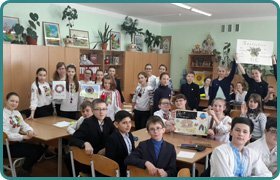 During the festival of foreign languages, the students of the 7B form under the guidance of T. Fedorenko, a teacher of foreign languages, conducted an educational web quest among the 7- grade students. 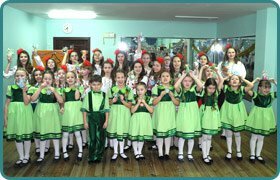 On April the 20th the “Embroidered Towel of Unity” summary concert of children's art collectives of Darnitsa district educational institutions took place in the framework of the All-Ukrainian “Pure Dew” children's creativity contest. The “Charm” theatre of dance from Scandinavian Gymnasium impressed the audience with their emotional song "The World without War". On April the 20th Viґdis Yorty, a popular Norwegian writer, the guest of the Book Arsenal, visited Scandinavian Gymnasium. Her books have been translated into Danish, Icelandic, Russian, Swedish, German and Ukrainian languages. On April the 13th our students met with O. Trambovetsky, a renowned psychotherapist, clinical psychologist, director of the Kyiv “Revival” Center which treats people from alcoholic-, tobacco-, drug dependence, and gambling addiction. On April the 12th Svetlana Sorochinskaya, the chief methodologist of Pearson-Dinternal publishing house and the certified examiner provided a pedagogical workshop for our teachers of foreign languages on effective lexical and grammatical tasks according to modern communicative techniques. Creative Competition "I Love Cooking"
The students of Scandinavian Gymnasium took part in the "I Love Cooking" competition. 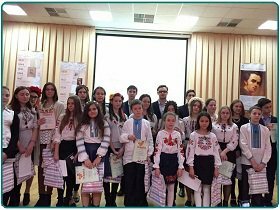 On April the 12th in the framework of the Festival of Foreign Languages the students of the 5th forms presented their works. At Scandinavian Gymnasium everybody knows that Roman Fedyurko (5G) is a little pianist virtuoso. The gymnasium is proud of his victories in various international competitions of young performers. 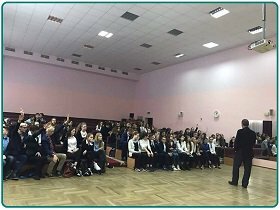 On April the 7th the professional orientation meeting of the ninth-graders at Kiev international University took place. Scandinavian Gymnasium and KIU concluded a cooperation agreement and the Days of Scandinavian Gymnasium at KIU have already become traditional. The athletes of our gymnasium traditionally win impressive victories. This year Maria, Koshechko (9G) won the I place (kumite) and the III place (kate) in the World Cup on Karate Shotokan as a part of a national team of Ukraine in the city of Bigdosh (Republic of Poland). On April the 5th in the framework of the Festival of Foreign Languages a very useful and interesting lesson took place. Robert Hartigan, a native speaker, a methodologist and a representative of Pearson Editing House came to the 5G form. 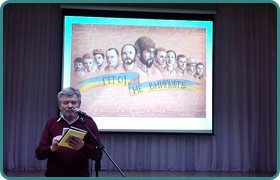 Traditionally, in March the festival of the Department of Public and Humanitarian Disciplines timed to coincide with Taras Shevchenko 202nd anniversary took place in Scandinavian Gymnasium. All the teachers of the department, the librarian, and the students joined the events. In March the students studying Finnish had the opportunity to meet a native speaker who came to our gymnasium. 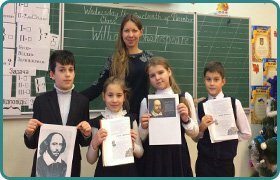 Mrs. Saana Walker comes from the city of Kukhmoynen, Finland, but for several years has been engaged in teaching literature in Ukraine. On March the 16th, 2016 in the assembly hall of Scandinavian Gymnasium a matinee performance "The first love" prepared by the students who study at the “Carnival” drama studio took place. Little actors sang, danced, recited verses about the first love with pleasure. The children helped and supported each other on the stage. 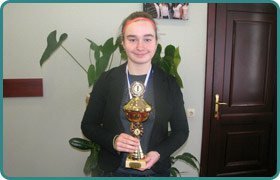 We congratulate Darya Snigur (8A) who won the European championship «Winter Cups by HEAD» in the city of Rakovnik (Czech Republic) having become the Champion of Europe and, respectively, the first racket among the participants younger than 14 years old. 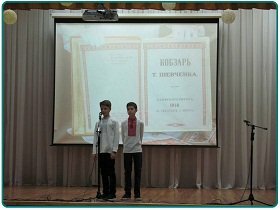 On March the 14th, 2016 the regional competition of Taras Shevchenko verses readers “We hear you, the Kobza player, through centuries" took place. 36 contestants recited Shevchenko's verses in Armenian, Azerbaijani, Finnish, Polish, Korean, German, English, and Ukrainian. It is simple to live in consent if you are able to love and respect people who are close to you. United we stand, divided we fall. Creating friendly relations in a family and a school family in particular is the aim of the family week. On March the 11th our senior students had an opportunity to join the world of wonderful poetry of Anastasia Dmitruk, a young Ukrainian poetess, the author of the poem " We Will Never Be Brothers..." written in connection with the Russian annexation of the Crimea. Scandinavian Gymnasium is a laboratory where we teach and bring up our little students, open and develop abilities of each child, create all conditions for development of creative thinking and self-expression of the personality in different types of activity. Excitedly pupils of the elementary school took part in all the events of humanitarian week. 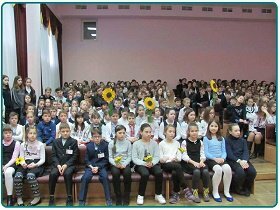 On March the 3rd 530 students from 2-11 forms took part in All-Ukrainian game "Sunflower — 2016". The opening ceremony traditionally took place in the assembly hall of Scandinavian Gymnasium where festively dressed students received instructions and manuals on performance of the tasks. 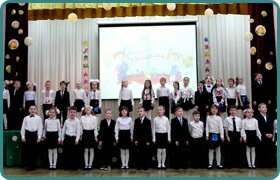 On March the 2nd the regional stage of a school choirs contest in the framework of the All-Ukrainian "The Youth of Ukraine Sing” festival was held at school #296 of the Darnitsa district of Kyiv. 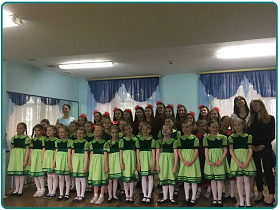 School choirs from 15 educational institutions participated in the contest including the choir of Scandinavian Gymnasium. This year more touching songs of the patriotic direction were sung. 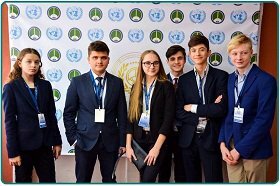 On February the 26th-27th the UN Model conference of the senior students took place at the Naukova Zmina lyceum in which two teams from Scandinavian Gymnasium took part. Delegations of the People's Republic of China and the Islamic Republic of Pakistan were also present at the event. In February, the Shogun Club had an extremely saturated schedule of travel. On February the 14th the Zvyagel Open 2016 competition took place in Novograd-Volynsk. Among 27 teams and 450 athletes the members of our Shogun Club won 8 gold, 5 silver and 12 bronze awards, and took the II all-command place. On February the 15th a creative intellectual festival "Constellation of Elementary School — 2016" started at Scandinavian Gymnasium. 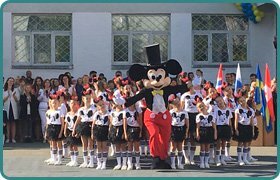 The week of creativity under the slogan "Ukraine Is Famous for Its Talents" is a marathon of children's competitions, contests, concerts, and exhibitions. February the 18th and the 19th are significant dates in the history of Ukraine. Two years ago at the cost of their lives the Ukrainians won the chance of the worthy European future. Different events were arranged in honor of the feat of the participants of the Revolution of Dignity and perpetuating the memory of the Heroes of the Heavenly Hundred. On February the 12th Scandinavian Gymnasium marked its eleventh anniversary. Traditionally, the students of the gymnasium presented their congratulations. 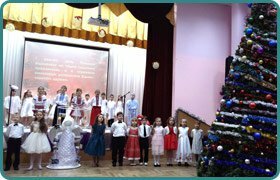 So, the students of the elementary school had special classes where they presented their creative works about the gymnasium, and the students of 5-11 grades had a big program of festive performances. Our Vanya is the Champion of Europe! On February the 7th in the city of Limassol (Cyprus) the Finals of the 43rd European Championship on karate among the youth, juniors and cadets took place. The national team of Ukraine took the sixth all-command place with 8 awards. On February the 4th Scandinavian Gymnasium hosted a regional seminar for teachers of foreign languages “On-line monitoring of educational accomplishments of 10-11-grade students. 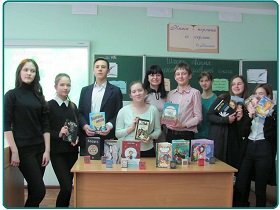 State Final Examination 2016” Inna Nestoiter, a representative of Macmillan Publishing House, gave a presentation. Congratulations to the Champion of Europe! 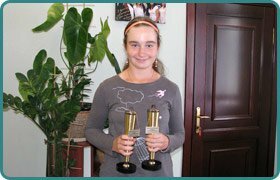 The New Year has brought a nice gift to theTennis Federation of Ukraine and to our gymnasium: Daria Snihur, our 8th-grader, has won the European Championship which took place in Moscow. Dear students, parents and teachers!! Let these wonderful days of winter bring peace, tranquility, harmony and confidence in the future. Let your hearts be warmed by love and warmth, houses be filled with goodness, joy and blessings of God, and your eyes shine with happiness. Let concerns and sorrows leave you at the last minute of the old year, and the new 2016 will be lavish in interesting plans, new achievements and professional victories. 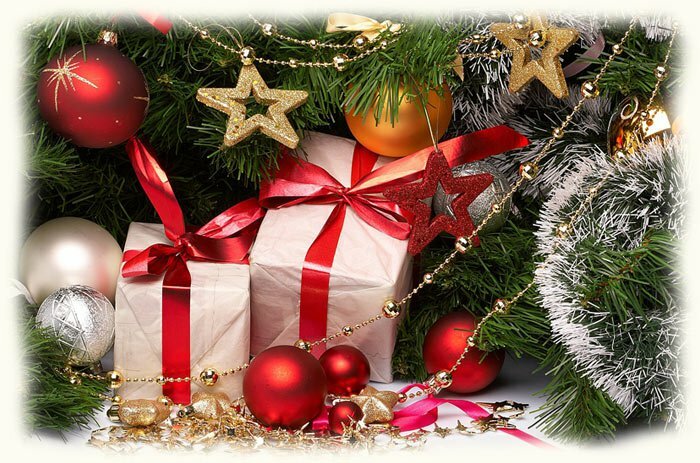 Let the Christmas star light in your hearts the fire of faith and love, hope and optimism, inspiration and inexhaustible energy! Our gymnasium has repeatedly participated in actions of support of the soldiers who defend our country. 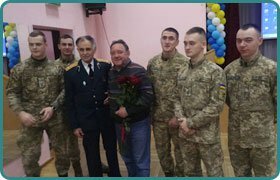 So, on the New Year's Eve the students of the 8B form collected letters of congratulation, sweet gifts, and things of prime necessity for ATO fighters. Celebration of the New Year is always a miracle of dreams and bright hopes, and holiday joyful expectations. It is not surprising that all the children love it. 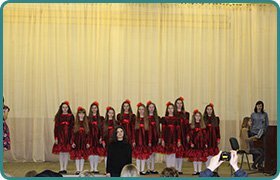 New Year's Concert of the "Merry Notes"
Every year on the eve of the New Year our gymnasium "Merry Notes" choir gives a summary concert for the guests in which they present new musical and literary compositions. 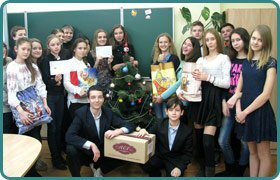 The students of Scandinavian Gymnasium joined the All-Ukrainian civil action "Send a Christmas letter to your neighbor" which was held on the initiative of the West-Ukrainian "Heritage of Ukraine" Association. The action took place from December the 10th to the 22nd, 2015. 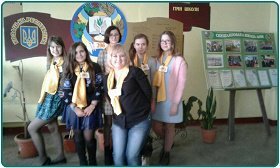 On December the 18th within the "We are different -we are equal" project a meeting of the 10th-graders with Professor Ekaterina Levchenko, Doctor of Law, President of the "La Strada-Ukraine" International Women's Rights Centre took place. 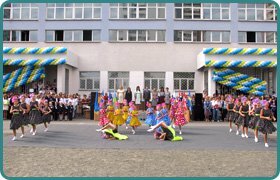 Our gymnasium cooperates with B. Grinchenko Pedagogical University on a regular basis. Talented students regularly get practical training sessions from the best teachers who share their skills, innovative approaches, and methods of teaching. On December the 14th the Day of Saint Lucia which is a national holiday of Sweden was traditionally celebrated at Scandinavian Gymnasium. The students studying Swedish moved in carnival procession dressed in white clothes and with burning candles. On the eve of the 67th the anniversary of the UN Universal Declaration of Human Rights a new project “We are different, we are equal” started at Scandinavian Gymnasium. The project is implemented with the support of the International Women's Rights Centre "La Strada - Ukraine" and the Association of Business and Professional Women of Kyiv. 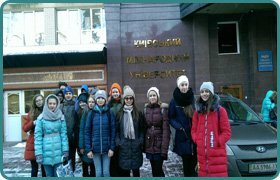 On December the 10th the students of Scandinavian Gymnasium who participated in the project of the young guides visited the Embassy of Hungary in Ukraine. They were invited by Yulia Smelyanskaya, Director of the Institute of Jewish Studies. 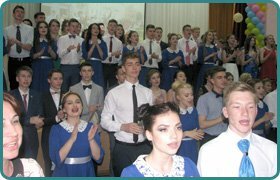 On December the 4th to mark the Day of Independence of Finland the students of Scandinavian Gymnasium joined the concert which took place on the premises of B. Grinchenko University of Kyiv. Meeting with teachers-native speakers have become traditional in our school. So this autumn Eldar Totland, a teacher of Norwegian, and Julia Pippet, a teacher of English, came to Scandinavian Gymnasium. 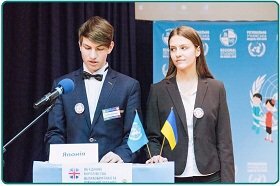 Students’ research activities within the territorial branch of the Kyiv Minor Academy of Sciences of Ukraine and the work at the "Erudite" scientific society promote development of students’ personalities, the ability to implement in practice the knowledge acquired during the training. 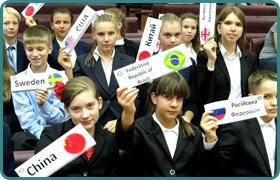 On November 27th- 29th the VII Regional conference of senior pupils "Model UN: Scandi-2015" took place at the Scandinavian Gymnasium. This year's area of discussion was "The fight against political, social and economic crisis through international cooperation." Having achieved Independence Ukrainian people reached a new stage of development - development of their own state. This process will continue for several decades, but as a result we will be able to see different Ukraine, the country we all dream of. On October the 22nd Scandinavian Gymnasium hosted the school stage of Kyiv open linguistics contest of high-school students. 62 high-school students participated in it. The contest is an opportunity to find generalities in different even unknown languages with the help of logic and mathematical functions, and to solve the proposed problems. From October the 20th through the 24th Scandinavian Gymnasium was visited by a group of students and teachers from Naestvedgymnasium (Naestved, Denmark). They were living in the families of the students learning Danish. Our gymnasium has been cooperating with this partner school for a long time, and now once again we are happy to meet with our northern friends. School is a wonderful world! It’s a place for hard work, for entertainment and recreation. Two months of training passed quickly for our first-graders. 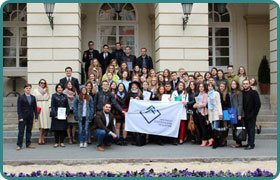 On the 16th- 18th of October, 2015 the I International Conference «Lviv UNM» was attended by the students of Scandinavian Gymnasium. Lviv kindly opened the doors for all the participants and among them for the citizens of Ghana, Switzerland and Bulgaria. On the 16th- 17th of October at school #167 the UN Model senior students’ conference was held. Scandinavian Gymnasium also took part in this game representing the Federal Republic of Brazil. Also, our graduates had certain positions in the Secretariat and worked as experts. 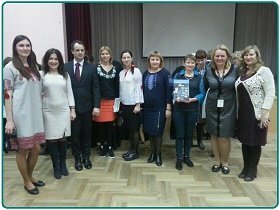 On October the 16th in the framework of the visiting session of the "School Headmaster" All-Ukrainian club the international scientific and practical conference "Management of multicultural education in schools in the conditions of reforming education in Ukraine" took place in Scandinavian Gymnasium. 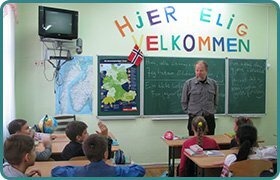 From September the 28th through October the 5th Scandinavian Gymnasium took part in the global project "The World's Largest Lesson" by UNICEF. The aim of this project is to tell the children about global sustainable development objectives which were adopted in the spring and will be relevant up to 2030. In October, Scandinavian Gymnasium was visited by the guests from Denmark: Michael Castor (Micael Castor), singer, composer and Tommy Hougord Nielsen (Tommy Hovgaard Nielsen), writer and musician who held classes with the students of the 8th and 10th-11th grades studying Danish. In early October, all the teachers and educationalists celebrate their professional holiday –Teachers’ Day. 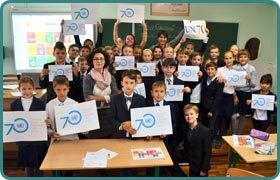 On September the 26th Maria Sklodovska-Curie Lyceum in Sopot (Poland) celebrated its 70th anniversary. The Lyceum is a partner school of our gymnasium. Tatiana E. Pushkareva, the Headmistress of Scandinavian Gymnasium, and Anna V. Bryukhanova, a psychologist, visited the Polish school and congratulated colleagues on the momentous date. On September the 26th Scandinavian Gymnasium hosted a truly unique event – “UN Model: Scandy – Junior 2015”. This game was an opportunity for our 7-graders to feel themselves real delegates of the United Nations Organization. In addition to the students of Scandinavian Gymnasium a team of the Naukova Zmina Lyceum also took part in the game. They represented the Kingdom of Spain. 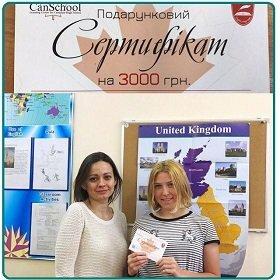 This summer vacation proved to be extremely interesting and productive for Daria Snihur, a student of the 8-A form of our gymnasium. 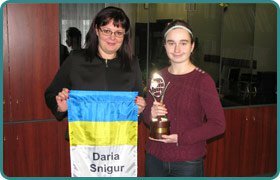 In the national tennis team of Ukraine Daria participated in the international competitions in Romania, Latvia, the Czech Republic and Belgium. Again the morning of the first day of September was filled with the melodious sound of the school bell. The streets of Kyiv blossomed with twittering, smiles of children and young people, and magic blizzard of autumn asters. Nostalgic glances of adults, awe, sadness and joy were closely interwoven.